So you are thinking about changing the flooring you currently have? We all have at one time or another. You can’t stand the color of that tile (the 80s are not always the color choices of 2011), the carpet has had better days (it used to be soft and fluffy) and now you want to freshen up the floors. Two years ago, you might of thought an option was to sell the house and get one with everything new. That was then, this is now. The economy has forced us to rethink our purchases. This conspicuous consumption has not fulfilled ourselves and only helped us spend money and waste material. I am not saying you should rush home, live in a tree house, get completely off the grid, make handmade hemp clothing, start eating bark and throw style to the wind. What I am saying is that we have rethought how we should spend and what will be more sensible. We make some of our biggest purchases for our home. We want those products or choices to last and ultimately help our bottom-line on our family budget. We want to make choices that will be more sustainable. We buy different light bulbs, toilets that use less water, appliances that use less energy. When looking at flooring, we have options that can do the same. There are many options, hundreds of options of material, texture, color, look, feel, finish for flooring. 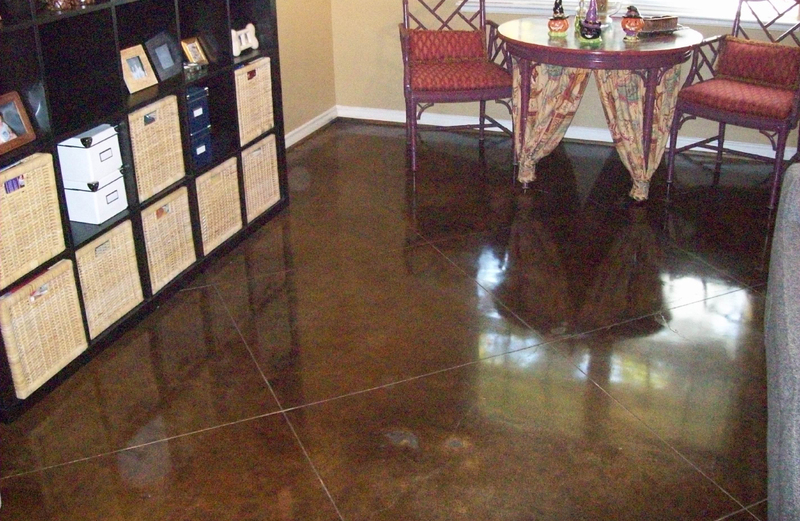 Stained concrete has been around for decades. I have customers all the time say, “Well, this is the latest fad, how long have you been in business? 5 years?” They are shocked when I say that my company has been around for 12 years, that I started learning 20 years ago and that the man I learned the trade from started in the 1960s. Just because HGTV has just started talking about it the past few years, doesn’t mean that it’s new. I am not trying to knock them. I can find myself watching HGTV late at night, and the one thing that the channel has helped is awareness of materials, styles and other possibilities to the average person. Reuse: If you have a concrete slab foundation, the flooring is already there to reuse. Most of the time the floor will need help cleaning off older material and preparing it for stain, but we will reuse the concrete slab. The original slab is reused and gives most of the character and variation naturally. Reduce: Because we are reusing the slab, the main material is already there. We bring in stain and seal, but it is substantially less material than any other traditional flooring. We don’t need a heavy duty truck to haul in hundreds of pounds of tile, carpet, wood or stone. The floors are easier to keep clean and thus reduce cleaning costs. Recycle: For this type of flooring, you have three main options for recycling. You could refinish the floor down the road to give it a different color or sheen. The second option is recycling the floor for its original use, a foundation (you can easily put other types of flooring over it without having to tear out and dispose of the flooring material). The third option would be in the demolition of the concrete, which would mean generally the demolition of the home, it can be crushed and recycled for fill on other projects. This is a hot topic recently as we try to waste less: money, raw materials and our time. Choosing the products we use is a simple way to look out for ourselves and the environment. They are not mutually exclusive, we can benefit both at the same time. I will address some of the categories next time about what makes a green product.